Triumph and tragedy converged when last we saw Derry Girls. While Orla was being verbally abused for her step-aerobics talent-show routine at school, the other lasses (plus token chap, Englishman James) came together in a moving show of unity. Meanwhile, back at home, the grown-ups were watching news footage of an IRA outrage, previous animosity put to one side in another display of community bonding. As we hook up with them again, a campaign is underway to bring the Catholics of Derry and the Protestants of Londonderry together in a touching hands-across-the-barricades type gesture. The only problem is that the main touching those girls want to happen with 'the Prods' is largely inappropriate. While Sister Michael (Siobhan McSweeney's character is probably given the largest degree of funny lines in the show) meets her match in a stony-faced Ms Taylor (Caoimhe Farren), a 'cool' cleric tries to inject a bit of humanity and understanding into proceedings. This leads to the opening episode's highlight, where the assembled youngsters are asked to come up with a list of similarities and differences between these two branches of Christianity. Quite probably Channel 4's biggest sitcom success since the equally Irish, Craggy Island-set Father Ted, Lisa McGee has certainly found a hit on her hands, apparently to her utter astonishment. This solid series opener has McGee responding to friendly appeals from Protestants to have more representation in the sitcom, and the four lads who are variously set on by Erin and co do add another dimension to the show, even if it turns out to be a one-off. Of course, it's not all about the young ones, as the grown-up relationships fester and fumble, with Tommy Tiernan's feckless Gerry being tormented by his father-in-law (Ian McElhinney) who simply waits in the wings not-so gently hoping for the day when his daughter will be free from this 'fecker'. 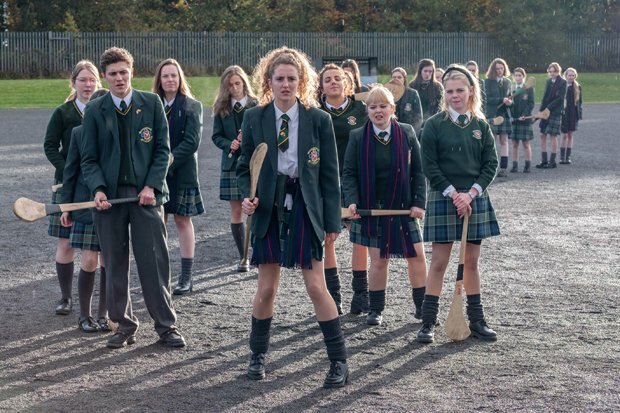 It might have a lot to live up to, but the Derry Girls return looks like being a welcome one. Derry Girls starts on Channel 4, Tuesday 5 March, 9.15pm.